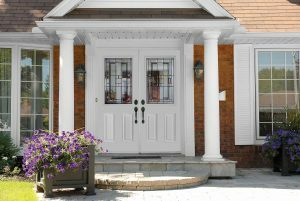 Entry doors have come a long way over the last few decades, and the number of door choices can be a little overwhelming. As a custom window and door manufacturer, a variety of choice is a great thing, but we also want to help you understand what door is right for you. For many home owners, the choice is often between a metal or fiberglass door to get a good balance of affordability, low maintenance and beauty. 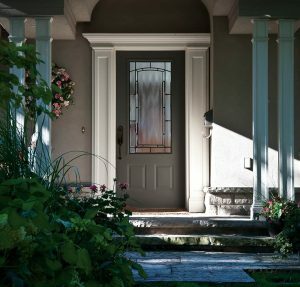 There are some key differences between a fiberglass and metal door, and we’ll go over them to help you decide which type of door might be right for you. Metal doors are pretty self explanatory, as they are often just sheets of metal, usually aluminum or steel, with some type of foam core. Fiberglass doors are made from sheets of interwoven glass fibres that are extremely strong when bonded together. It’s the same strength that you’d find in a fiberglass boat hull or airplane cabin. The major difference between metal and fiberglass comes down to look and strength. With fiberglass, you can form, shape and texture them in almost infinite ways. The technology has advanced so much, it’s hard to tell the difference between fiberglass and wood doors. With metal doors the designs can be modern and beautiful, but they’ll never look like wood. The real benefit in a metal door is their strength. The best way to understand the construction is to think about the hull of a boat. Both fiberglass and metal boats are built to last a long time under extreme conditions, but picture taking an axe to a metal and fiberglass boat hull: The metal will fare better than fiberglass. One caveat here is the type of metal used, and how thick it is. Cheaper metal doors will often contain two thin sheets of aluminum. Thin aluminum can dent easily and warp under changing weather conditions, so you’ll want to make sure you ask about how your metal door is made during the buying process. The Core of both doors is generally similar consisting of some type of rigid foam to add insulation and increase the R value, and to give the fiberglass or metal sheets some additional strength. In terms of cost, a fiberglass door will cost more than a comparable metal one. However, a fiberglass door is significantly more affordable than a comparable wood door. If you’re looking to get that wood look but with more durability and lower maintenance, fiberglass can’t be beat. Metal doors can vary greatly in price depending on how they’re built, as mentioned above. Overall, they’re generally less expensive than a similar fiberglass door, but the type of metal, the thickness, and the security features can all add to the price. Read more about what goes into the cost of an exterior door. Both doors are extremely durable and low maintenance. With a fiberglass door, you’ll pay a little more, but the door will be a little less prone to warping, scratches and dents than a steel door. A fiberglass door is virtually maintenance free, and can be cleaned with simple soap and water. Metal doors are a little more tricky. Small dents can usually be repaired using similar dent-repair methods used on car bodies. If you scratch a metal door, you’ll want to properly prime and paint it so any rust or corrosion doesn’t occur. As always, it really depends on your climate, where the door will be positioned, and of course the type of look you’re going for. You can browse metal doors and fiberglass doors on our site, and of course, drop by our showroom and talk to one of our experts for an in-depth look at which doors will work best for you!